An MP's is a full-time job, so is the BCCI president's. How can Anurag Thakur do justice to both, asks Sudhir Bisht. Let me begin by saying that I don't grudge the upward journey in politics and in sports, and in social standing, of the affable and charming Anurag Thakur one bit. I know that he wouldn't have made it to where he is today if he were not the son of Prem Kumar Dhumal, the down-to-earth ex-chief minister of Himachal Pradesh. But then, in politics and in sports power structures, it is almost impossible to rise if one is not the son of a successful, influential father. And for every case of a rising son of a successful father, there are many more cases of wasted opportunities by young sons of eminent fathers who could have leveraged the head start they received just because of being their fathers' sons. Anurag Thakur didn't lose his head despite being the son of the chief minister of the most beautiful state in India. The work culture of Himachal Pradesh is rather laidback and easy-going. But Anurag didn't fritter away the head start he got and has achieved much for the Himachal Pradesh Cricket Association. The way he transformed cricket infrastructure in Himachal Pradesh is worthy of emulation. Would he have achieved so much if his father wasn't the CM of Himachal Pradesh isn't the moot point. That he used his powerful connections to put his tiny state on the cricketing map is what is noteworthy. I am also not one who believes that cricketers should have a major part to play in the administrative set-up of cricket in India. Look how the quartet of recently retired, most eminent and respected cricketers haven't even met enough number of times to discuss who the Indian coach should be. But let me turn back to Anurag, the newly minted president of the Board of Control for Cricket in India. He is the king of all he would survey, the most powerful head of the most powerful sport in India -- after politics, of course! Everyone is flooding Anurag with compliments and his office is now requesting admirers to not come with bouquets. While I rejoice at the young man's moment of glory, I can't help treading in the not so comfortable terrain of examining things critically when all seems to be rosy. Old habit! The question playing on my mind is: How can a person who is a full-time MP also be a full-time president of the BCCI? Remember that the buck stops with the BCCI president. Whether it is the conduct of the IPL team owners or the board's willingness to host the Pakistani team, the key decision maker is the BCCI president. And with the massive task of implementing the Lodha Committee's recommendations, something which made Anurag's predecessor opt for the safer environs of the International Cricket Council, the challenges before the BCCI president are huge. This reorganisation will be an uphill task for the BCCI president. The existing satraps will be most unwilling to give up their clout and the new state units, hitherto unrepresented, will be itching to get into the power play. Another key issue is that the board president has to either follow the Lodha panel's observations that could lead to reducing advertising opportunities or the president will have to convince the Supreme Court that the Lodha panel advisory isn't good for the game. The BCCI will also have to look for new sources of funding the game if advertising revenues take a hit. And if the board tries to protect its advertising revenues, it will provide cannon fodder to those who think that what really ails Indian cricket is too much lust for money and too little love for the game. The BCCI has come under intense public scrutiny recently due to the hosting of IPL matches in drought-affected states. A ruthless campaign, somewhat fair and many times unfair, that occupied prime time across all television channels led to several changes in IPL venues. The BCCI has much to contend with nowadays. In international circles, it has this huge image of being a despot bent upon dominating world cricket along with its cohorts England and Australia. Within India, the BCCI faces all kinds of interrogation -- in the mainstream media as well as social media. It has to quickly shed its image of being a money-making machine and reposition itself as the patron of cricket that is solely dedicated to promoting the game and not the commercial merchandise that is associated with it. In short, the BCCI president will need to be hands-on, full-time. No doubt there is a professional CEO (Rahul Johri, a professional with little cricketing background) to support the president, but the BCCI secretary (Ajay Shirke) has already challenged this designation as he feels the secretary is the chief executive of the BCCI as per the board's constitution. 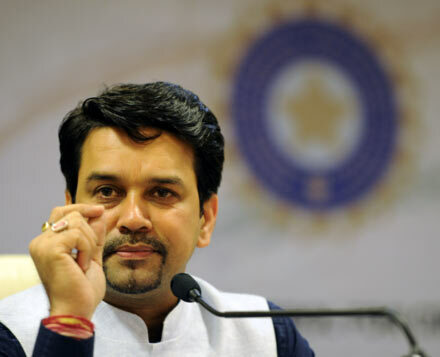 In short, as BCCI president, Anurag Thakur's life will see a huge transformation, as it will not permit him to be either a full-time Lok Sabha MP or at the same time a full-time BCCI president. Thakur is a young gun of the BJP. His political career has been consistent and just short of being spectacular. He is a third-time MP, which is creditable as he is only 42. His track record in the Lok Sabha has been brilliant lately. He was fielded as the key speaker to take on the Congress party over the JNU row. He gave a rousing speech which was full of rhetoric but also equally strong on logic. Anurag is a key member of the BJP's young brigade and is very astute politically. Some BJP leaders I know say that in the very near future he could be projected as the next chief minister of Himachal Pradesh. But the life of a successful parliamentarian is an awfully busy one. He has at least three sessions of Parliament to contend with. The Budget session, which is held from February to May, the Monsoon session, which is conducted from July to September, and the Winter session, which is from November to December. This means that MPs have to be busy with Parliament for at least nine months in a year. Agreed that there are vacations within each session, but then Anurag Thakur is also chairman of the parliamentary committee on IT, arguably one of the most high profile ones today. The committee is supposed to pore over all the bills which have anything to do with information technology, and given the push for Digital India by the prime minister, the chairman of such a committee would seem to be neck deep in work. Anurag Thakur is also president of the BJP's youth wing, the Bharatiya Janata Yuva Morcha. Illustrious BJP leaders like the late Pramod Mahajan, Uma Bharti and Shivraj Singh Chauhan have occupied this post in the past. After his full-time occupation over nine months with Parliament and its committee on IT, Mr Thakur must devote at least 60 days to BJYM affairs. I also gather from his Facebook page that he is also a member, public accounts committee; a member of the parliamentary consultative committee for power; the parliamentary party spokesperson in the Lok Sabha; president, Himachal Pradesh Olympic Association; vice-president, Indian Olympic Association; vice-president, Hockey India; and secretary general, Hockey Himachal Pradesh. Simple mathematics shows that Anurag Thakur has absolutely no time for being a full-time BCCI president. For those who say that the BCCI presidency is a part-time job, I would submit that if true, then the new BCCI president should take on the title of non-executive chairman and leave the BCCI presidency to someone who can devote himself to the cause of cricket 24x7. Or else, Mr Thakur should shed some of his existing responsibilities. He can resign as Lok Sabha MP and allow the people of his Hamirpur constituency to elect a full-time MP whose sole job is to help the national legislative process and nurture a constituency of 1.2 million people. One more point that I want to dwell upon is the fact Anurag Thakur has been elected unopposed as BCCI president has come for much applause. As if lack of competition is a virtue! Remember how the presidents of almost all political parties are elected unopposed? Is it fair that the top post of the most important sporting body is filled up without a fair contest? Maybe because there is no legitimate fight, there is often infighting and backbiting in national parties and the BCCI. I leave this as food for thought for the lovers of sports and politics in India.